Dr. Bobby Birdi, with the help of his colleagues, founded the BC Perio Dental Health and Implant Centre with a very specific goal in mind: to help patients regain the ability to smile, chew and speak comfortably, either through providing the highest quality of dental implant, periodontal, or prosthetic treatment possible, or through enabling fellow dentists through focused, practical education to perform a variety of dental procedures. 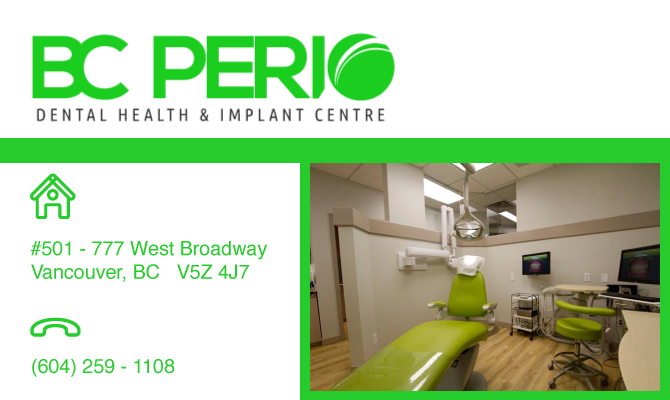 The doctors at BC Perio Dental Health and Implant Centre specialize in all facets of periodontal and surgical therapy, with a strong focus on dental implant treatments that can replace single, multiple, or all missing teeth. In addition, the clinic provides minimally invasive nonsurgical and surgical treatment using the newest cutting-edge technology such as microscopes, lasers, and computer-guided surgery. We look forward to helping you with your oral health! Dr. Bobby HS Birdi is one of North America’s very few Certified Dual Specialists in Periodontics and Prosthodontics (Periodontist & Prosthodontist), and the first and only specialist in the world to attain Canadian and American board certifications in both Periodontics and Prosthodontics. He received his dental degree from the University of Saskatchewan and his post-graduate specialty training in both periodontics and prosthodontics from the University of Minnesota. He is a Fellow and Examiner for the Royal College of Dentists of Canada, and a Diplomate of both the American Board of Periodontology, and the American Board of Prosthodontics. He is also an active member of the Canadian Academy of Periodontology and the British Columbia Society of Periodontists, as well as the Association of Prosthodontists of Canada and British Columbia Society of Prosthodontists. Dr. Birdi is a member of multiple dental implant organizations such as the American Academy of Implant Dentistry, the International Congress of Oral Implantologists, the Academy of Osseointegration, and the International Team for Implantology. He is well-published in the areas of dental implants and surgery. Dr. Birdi is a reviewer for the Journal of Oral Implantology, Clinical Advances in Periodontics, and the International Journal of Oral & Maxillofacial Implants (JOMI), to which he has been appointed to the Editorial Review Board. Dr. Birdi is an adjunct Associate Professor at the University of British Columbia and the University of Minnesota, where he is involved in multiple dental implant research projects and clinical trials. He also actively lectures both nationally and internationally in the fields of implant surgery and prosthetics, as well as aesthetic dentistry. Dr. Birdi is presently the co-director of the Pacific Implant Institute located in Vancouver, Canada, which is a learning centre for his fellow dentists. Dr. Birdi loves spending quality time with his family, and enjoys sporting events, exercising, and travelling in his spare time. Dr. Birdi and Dr. Zokol host Your Dental Health Solutions, a radio show on CKNW AM908, one of the area’s top radio stations. Dr. Peter Munns is a Certified Specialist in Periodontics (Periodontist) and has over 30 years of experience in helping patients as a specialist in BC. He received his dental degree from the University College Hospital in London, UK, and then completed his post-graduate specialty training in periodontics as well as his master’s degree from Boston University. Dr. Munns has taught undergraduate and graduate-level periodontics at the University of Washington, the University of British Columbia, and Vancouver General Hospital. Dr. Munns shares his interest in periodontal, reconstructive and dental implant procedures through a myriad of lectures and consulting work. He has previously served as the President of the Canadian Academy of Periodontology, and the Dental Specialists Society of British Columbia. Throughout his career, Dr. Munns has also served on various committees for the American Academy of Periodontology, the British Columbia Society of Periodontists, and the Vancouver and District Dental Society. Among other prestigious institutions, Dr. Munns is a member of the College of Dental Surgeons of British Columbia, the Canadian Dental Association, the Academy of Osseointegration, the Canadian Academy of Periodontology and the British Columbia Society of Periodontists. Dr. Munns enjoys writing poetry, singing opera, travelling, and spending time with his family in his spare time. Dr. Tim Gould is a Certified Specialist in Periodontics (Periodontist) and has been helping patients and teaching colleagues in the field of periodontics for over 30 years. He received his dental degree from the Guy’s Hospital in London, UK, and then completed his post-graduate specialty training in periodontics as well as his PhD at the University of Toronto. Dr. Gould has previously been Chairman of the Division of Periodontics and the Director of Post-graduate Periodontal Education at the Faculty of Dentistry at the University of British Columbia. He remains a part-time clinical associate professor at UBC, teaching in the Post-Graduate Periodontics Program. Dr. Gould has won multiple “Excellence in Teaching” awards from the American Academy of Periodontology. Dr. Gould has conducted numerous studies on periodontics, and has published over 30 research articles in the area of periodontology. Throughout his career, Dr. Gould has also lectured both nationally and internationally in the fields of Periodontics and Periodontal Plastic Surgery. Dr. Gould has served as chairman of several committees for the College of Dental Surgeons of British Columbia, and has just recently finished his term as President of the Canadian Academy of Periodontology. Dr. Gould has also been a Board Member on the British Columbia Dental Association and currently serves on two committees for the Association. Dr. Gould is also a member of many organizations such as the College of Dental Surgeons of British Columbia, the Canadian Academy of Periodontology, and the British Columbia Dental Association, to name a few. Dr. Gould enjoys travelling and boating in his spare time. Dr. Josh Kleinman Dr. Josh Kleinman is a Certified Specialist in Periodontics (Periodontist) and has over 30 years of experience in periodontal care. He earned his dental degree from the University of Montreal, and then completed his post-graduate specialty training in periodontics as well as his master’s degree at Indiana University. Dr. Kleinman’s career has been highlighted by his commitment to education while working in private practice. He has taught periodontics at Indiana University, the University of British Columbia, and the Hebrew University of Jerusalem Dental School. Dr. Kleinman has conducted numerous studies on periodontics, and is well published in the area of periodontology. He has also given numerous lectures throughout his dental career while, mentoring various Vancouver study clubs. Dr. Kleinman has previously served as President of the British Columbia Society of Periodontists and the Vancouver Alpha Omega International Dental Society. He continues to play an active role in many organizations such as the Canadian Academy of Periodontology, the BC Society of Periodontists, the American Academy of Periodontology, the Canadian Dental Association, the British Columbia Dental Specialists Society, and the Alpha Omega Dental Society. Dr. Kleinman enjoys spending time with his wife Rowena, and their two daughters and two grandchildren. Dr. Zokol is proud to acknowledge his 20 years of practice partnership with his father, a certified specialist in prosthodontics. Prior to his involvement with implant dentistry, he became recognized for his restorative skills with direct and indirect gold restorations, resulting in him being awarded “Clinician of the Year” by the American Academy of Gold Foil Operators award in 1997. Dr. Zokol is a Diplomate of the American Board of Oral Implantology/Implant Dentistry and of the International Congress of Oral Implantologists. He holds Fellowships in the American Academy of Implant Dentistry, the American College of Dentists, and the Academy of Dentistry International. He has over 25 years of experience in implant dentistry and has spent more than 10 years as a surgical instructor for the Misch International Implant Institute. Over the last 30 years, Dr. Zokol has been appointed to many posts in numerous dental associations, including the presidency of the Vancouver and District Dental Society, Chair of the General Examination Committee, and Chief Examiner for the College of Dental Surgeons of British Columbia. Dr. Zokol has lectured internationally for many years in the field of Prosthodontics and Implant Surgery and is presently the director of the Pacific Implant Institute located in Vancouver, Canada, which is a learning centre for his fellow dentists. Dr. Zokol lives in Vancouver with his wife, Marie and their three sons. Dr. Birdi and Dr. Zokol host Your Dental Health Solutions, a radio show on CKNW AM980, one of the area’s top radio stations.